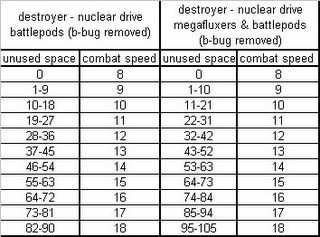 the destroyer has 60 space avaiable which we will define as hull size. Let us now analyze the battlepods (without megafluxers). The results are now a bit incosistent. You cant describe them by "more space=more speed" any longer. The megafluxers increase dM is added to the hull size. 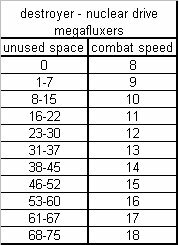 Therefore some empty battlepods ships even slow down when you research megafluxers. Other values than 2 are also an option (especially when combined with Solution II.). A switch which determines the unused space bonus would be a nice option to test different values. The denominator 1.5 achieves that a full battlepod ship will have the same speed as under the status quo. The value reflects the battlepod increase (HS+dB)/HS. This value 1.5 works for dd-doomstar, for a ff the exact value 37/25 should be used. 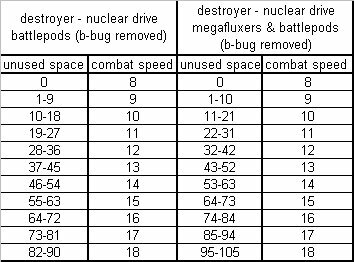 b) a full destroyer (without bp or m) is now a bit faster than under the status quo (combat speed 12). BP ship the blue graph. 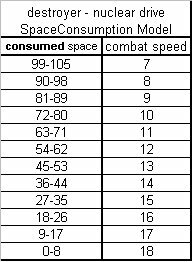 (Space consumption 0-90) There is even the above mentioned speed decrease. 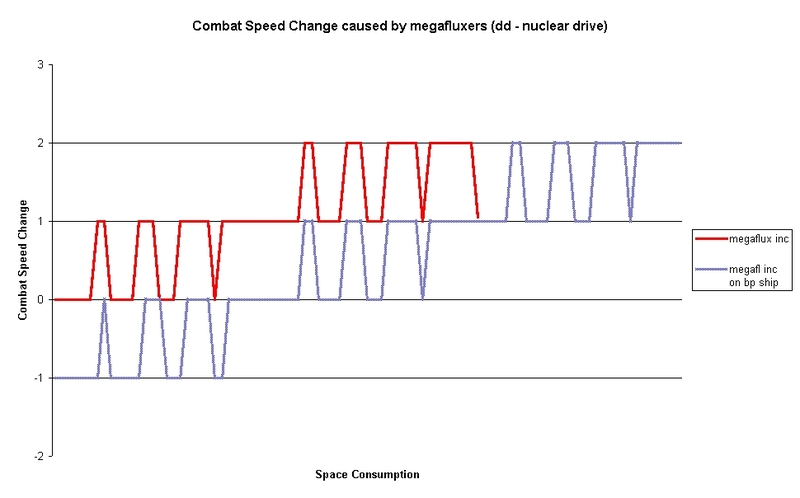 The speed decrease will be eliminated in a pure megafluxers solution (solution II) but results similar to the red graph will persist. And IMO there is no convincing explanation for such behaviour. IMO solutions based on space consumption models (solution IV) should be the way to go. 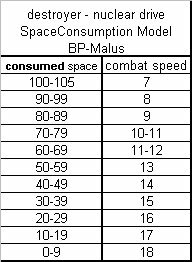 (XII) combat speed = maximum combat speed - round down [6 * ( consumed space / hull size )] and -1 when bps are used. 0-60 using battlepods is inefficient. 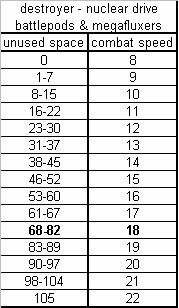 76-105 using them is necessary. Adding BPs and consuming the extra space is always a loss of 4 combatspeed and -20 beamdefence then. 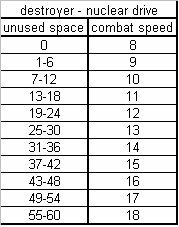 (XIII) combat speed = maximum combat speed - C - round down [(9-C)/1.5 * ( consumed space / hull size )] and -1 when bps are used. 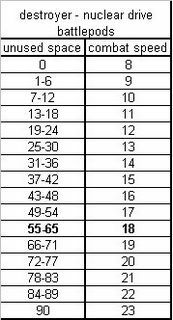 In the red row at top you see the maximum speed decrease. 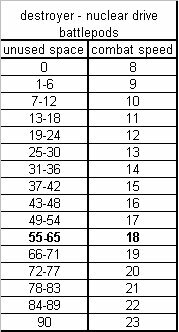 The lower red row shows that the speed for a full bp-ff is unchanged. The beige row is important for aug eng ffs. (aug eng consumes 10 space). Just add 5 combat speed to this row and you receive the combat speed of these runners. 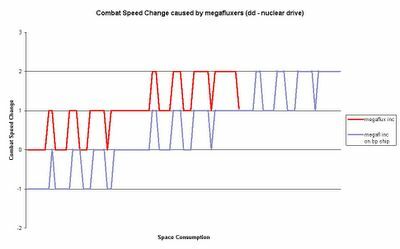 According to dirt-bag a runner with 22 combat speed is unable to outrun a fast nuke (on iondrive-lvl 18 speed). The C-Value of 7 should be his preferred solution then. You know... I really love this game, but... Wow! You guys must have played it a lot more than me to notice things like that!